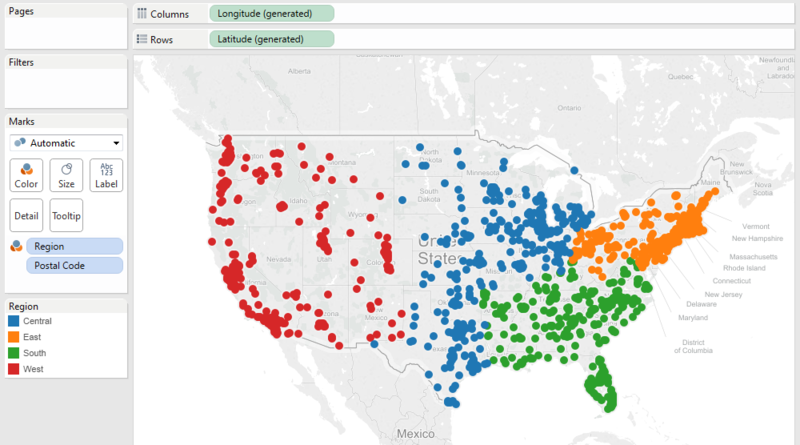 Last time we looked at a simple way to implement custom geocoding in Tableau using the ability to assign latitude and longitude to unknown locations. That’s a fairly good option if you only have a few locaitons and only need to plot marks on a map or two in a single workbook. But what happens if you have a lot of locations? Or what if you want to reuse the solution in multiple workbooks? There is a way! We’ll use the tried and true Superstore sample data to illustrate. This data set includes some fields with recognized geographic roles such as City, State, and Postal Code (Zip), but it also includes a Region field that does not have a geographic role. Now, this is purely an example and this data set only has 4 regions — so it wouldn’t be too difficult to lookup latitudes and longitudes and plug them into Tableau like we saw last week. But what if you had ten regions? Or 15 territories? And what if you want to reuse the results in more than one workbook? Here I have a mark for each Postal Code (Zip code) color coded by Region. You’ll notice that Regions contain multiple zip codes and a single zip code is contained in only one region. This data is really clean — but this technique will work even if the data isn’t quite so nice. Just have some kind of geographic relationship. 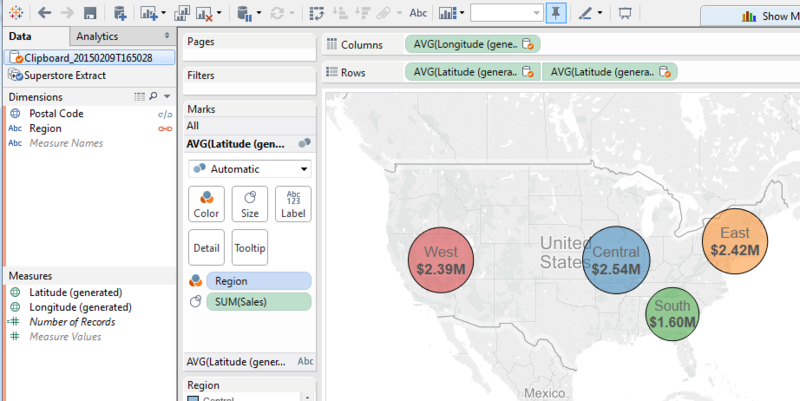 Here’s the trick — we’re going to capture Tableau’s values for latitude and longitude — along with the associated Region and then create another data source with that data. I press Ctrl + A to select all the marks on the map (or Area select them) and then right-click a mark and select “View Data”. And there it is, the data set I want! Now I have every zip code within a region along with the associated Latitude and Longitude. Now, simply press Ctrl + A to select all rows, then Copy, then close the dialog box, then Ctrl + V to paste back into Tableau as a new data source! We’ll start a new sheet with our original data set and put Region on the Marks card to define the level of detail. 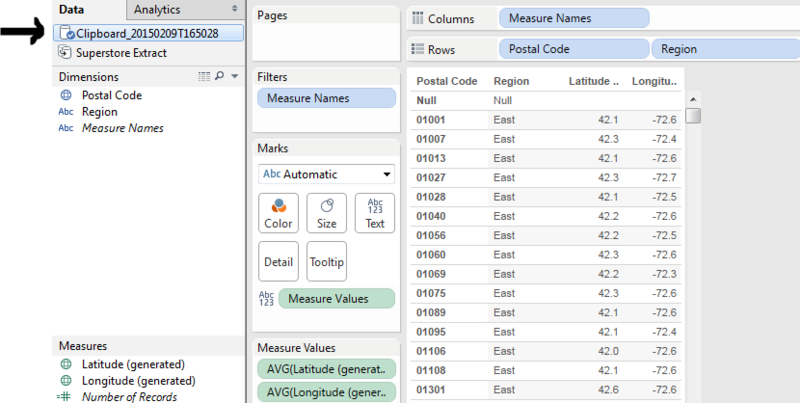 Then, we’ll switch to our new data source and bring out Latitude and Longitude to Rows and Columns. We’ll use an aggregation of AVG for both. Guess what? When we blend on Region, that’s the geographic center of all the zip codes within that Region! And there you have it! You now have an easy way to plot marks for any number of regions or territories or unknown geographic field based on the geographic center of a known geographic fields. Like it? Let me know in the comments and also check back next week for one more step that makes this even more exciting! I’m glad it helped! I’ve used the technique a few times and it’s great to have something you don’t have to rebuild each time. This is a great tip/ trick! Thank for sharing! Josh, any way to bring those label back over top the original data on a filled map? Can I do somewhat of the reverse? I have a table of geocoded points and I’d like to create another table of those points with the Zip Code data from the Tableau map added as a new column. 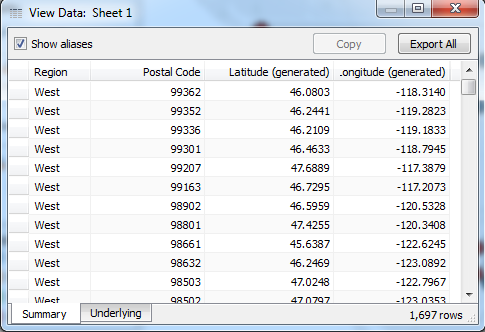 Basically it would result in a data set shwoing the zip code for each of my geocoded points. Thanks for very informative post! However I could not fine what I was looking for. I have a list of about 150 locations in the US, but tableau could not recognize 65 of them(I have state as well, but it still could not). The locations are name of cities/localities some of them are very small and remote localities, Google map does find them (I tried for some of them), so is there a way to generate Lat and Long from google maps/bing maps for plotting on map? Tableau does not include geocoding for small towns. I don’t remember the cutoff – but there is a population size at which Tableau will include locations in the internal database. You can use Google Maps or Bing, but it’s tedious (right-click in Google and select “What’s Here” — it will give you lat and lon). But you might also check out http://www.findlatitudeandlongitude.com/ to batch convert a few dozen to a few hundred locations. It is helpful for the time. but the point I am stuck at is it shows one location at a time and need an action to go to that location. I still think that there is an easy way to achieve it since I saw someone did similar thing in qlikview using API and scripting. Thanks for the informative article, Joshua! I ran into a problem with the “View Data” window, however. When I open that window, I see a lot of Null values for both Lat/Long. For context, I’m mapping student enrollment data by city, and it seems Tableau is finding a lot (2k) of “ambiguous” cities, thus refusing to plot them. I know you can “edit locations”, but that’s a LOT of coordinate data to manually enter! Thoughts? If you happen to have a way of providing your own latitude/longitude, even in a separate file — that might help. In versions before Tableau 10, you can use blending. In Tableau 10 you could even join in the file and then use the lat/lon for mapping.